LOS ANGELES, CA. IF LOST, PLEASE CHECK YOUR LOCAL HOCKEY RINK or Dog Park. This year’s campaign uses the depiction of a music sound-wave and celebrates the broader community of music fans. The artists all have a unique take on music that is able to bring us all together in a powerful and shared human experience. Throughout the campaign, fans will notice the captivating sound-wave design that will translate to social posts, such as static and video carousels on Facebook and Instagram. Various artists seem to break out of the wave, speaking to the idea of the live music listening experience and music’s ability to transcend the recording, touching people’s souls. Over 80% of girls agree that if they felt failing was okay during puberty, they would keep doing the things they loved, take on more challenges and grow in confidence. Their fears can be so overwhelming, that they would rather quit than fail. Gatorade wants to show girl athletes that failing, or even the fear of failing, shouldn’t be a reason to quit playing the sports that they love. No athlete can have a perfect game 100% of the time. We want to ease girls fears of failing by having female athlete share their own personal moments that they conquered. To make the content even more shareable we will create short animated videos based off of not only the athletes stories, but also stories submitted by young girls. Practice is the best way to shut down fears and achieve confidence. 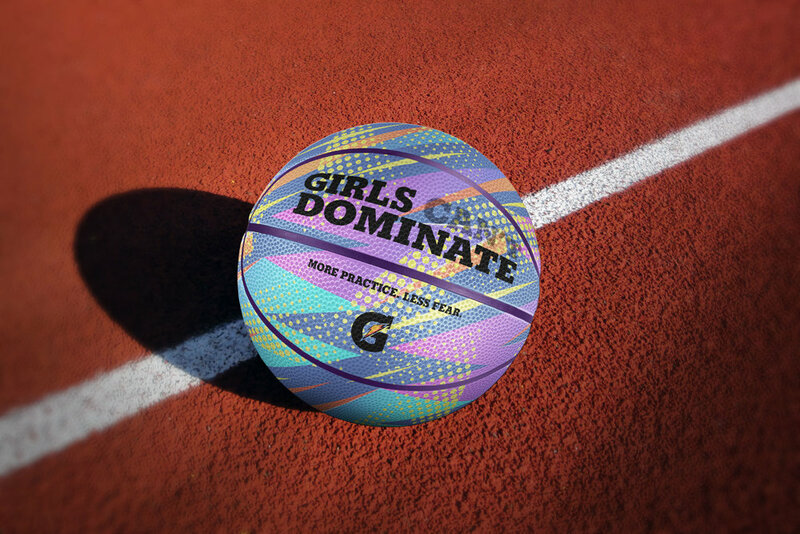 Gatorade wants to show this with special edition athletic balls for girls. They will have phrases written on them; where specific phrases will be printed in semi-permanent ink and fade away the more they practice. Gatorade will create the first pregame podcast to motivate girls when they need it most, right before their game. The podcast will end with each guest sharing their own pumped-up playlist and end the session with a pep-talk. We’ll select specific moments from the long format and create bite-sized content for Snapchat. “The World’s Most Immersive Film Experience.” For it’s 50th anniversary, IMAX launched it’s biggest global brand campaign ever in 77 countries and 39 languages. The campaign’s aim was to cut through the clutter and remind audiences that the cinema format is the most premium means to see a movie. We wanted to show how IMAX stands apart as a cinema experience with the biggest screens, the clearest images and heart-pounding audio, as well as 26% more picture for those films formatted in IMAX or shot with IMAX cameras. Chase provides personal financial strategies and wanted to show how consumers could take advantage of their services. We decided to use some unconventional stories to evoke a warm and fuzzy feeling not typically associated with banking. Prudential understands the impact that life insurance has on future generations. To illustrate this we created special edition books composed of the fairy tales we know and love.. with a twist. The Fate Keepers is a series of "choose your own adventure" style books depicting new opportunities for the main characters (also available on Amazon Alexa devices). Public transportation has yet to create a system that is efficiently and consistently wheelchair-accessible. From metro maps that are barely sprinkled with accessible stops to elevators that are regularly out of order, individuals that are already limited by a wheelchair are plagued with additional barriers throughout their daily commutes. Car2go will partner with the car company Kenguru, utilizing the engineering behind their wheelchair-accessible electric cars. This new fleet of cars will allow individuals in wheelchairs to lead a more independent life, easing their burden and removing their feeling of being a burden to others.